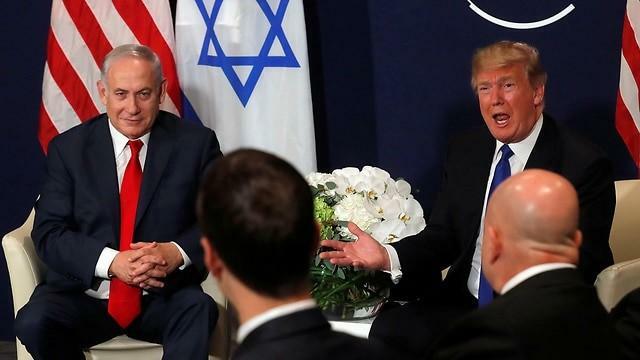 On Tuesday an Israeli television channel aired leaked video footage it obtained exclusively showing Prime Minister Benjamin Netanyahu boasting that he had personally convinced President Trump to abandon the Iran nuclear deal. The statements were made at a small dinner event where he addressed senior members of his Likud party. The video, aired by Israel's Kan News shows Netanyahu enthusiastically praising his and Likud leadership's efforts, saying “We convinced the US president [to exit the deal] and I had to stand up against the whole world and come out against this agreement." He added, "And we didn't give up." According to a translation of the prime minister's words by The Times of Israel he further agrees that "the Iranian regime" will "disappear with the help of God" — in the words of one of his supporters, to which Netanyahu adds, "You said it. From your mouth to God." Netanyahu does not explain in the video aired by Kan how he convinced Trump to exit the deal. Trump had vowed to scrap what he assailed as the “worst deal ever” before becoming president. The Israeli broadcaster that obtained the footage said it was filmed two weeks ago. When early this week the New York Times published the Israeli account of how a daring Mossad operation deep inside Iran netted what are said to be tens of thousands of secret Iranian nuclear documents in an "Ocean's 11"-style heist, we noted the Times story appeared to be a propaganda victory lap of sorts meant to further bolster Israeli intelligence's reputation and far-reaching abilities abroad. Netanyahu unveiled the stolen cache of about 55,000 pages of documents and 183 CDs in a television address that the said proved the existence of an illegal and ongoing secret program to "test and build nuclear weapons" called Project Amad. Just days after the colorful and prop-laden Netanyahu presentation, President Trump announced he would follow through on prior threats to pull out of the Iran nuclear deal, or JCPOA. Observers noted at the time that Netanyahu's address had a single audience in mind in the person of Donald Trump during the very week the White House was intensely mulling a final decision over whether to finally pull the plug on the JCPOA. While it appears Netanyahu had his April televised presentation in mind when he says in the clip "I had to stand up against the whole world," there is also little doubt that his personal appeals to Trump on the issue were even more direct and persistent. Other signatories to the deal brokered in 2015 under the Obama administration have vowed to stick by it, which include Britain, France, Germany, Russia, and China — even as the White House threatens punitive measures against any country that continues to do business with Iran. Earlier this summer it was confirmed that a high level joint US-Israeli "working group" under the oversight of National Security Advisor John Bolton has been meeting for months with the goal of facilitating regime change in Tehran. As Axios reported: "Israel and the United States formed a joint working group a few months ago that is focused on internal efforts to encourage protests within Iran and pressure the country's government." So it's very clear that Netanyahu has the White House's ear on Iran (though this is no surprise). Meanwhile, Netanyahu has posted to his official Twitter account a clip of Trump saying that Russian President Putin is a "Bibi fan". The statement came in a Fox News interview following the US president’s summit and press conference with Putin. Likely, Netanyahu will continue his boasting about his personal intervention and impact with the White House both in public and in private, so more such revelatory footage will probably surface in the coming months.